"At Mercy, we are focused on providing the highest level of quality, safety and service to all of our patients and are proud to be recognized for our commitment and dedication." - Sean Williams, President and CEO of Mercy Medical Center. 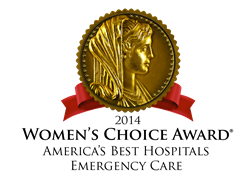 Mercy Medical Center – Clinton has been named a recipient of the Women’s Choice Award as one of America’s Best Hospitals in Emergency Care. Each year, there are more than 125 million emergency room visits in the U.S., with about a fifth of them being children under the age of 15. Emergency departments continue to be an essential part of the healthcare system as they provide fast, life-or-limb saving care to millions each year. The Women’s Choice Award is a distinction that identifies the nation’s best healthcare institutions and signifies Mercy’s commitment and passion for creating an extraordinary healthcare experience for women and all patients. The Women’s Choice Award is the lone recognition program that measures against the needs and preferences of women. Of the seven core measures reported by emergency departments to the Centers for Medicare and Medicaid Services (CMS), women rate “door to diagnostic time” or in other words, “door to doctor,” as the most important criteria when selecting an emergency room. Hospitals earning the Emergency Care Award consistently rank in the top 25 percent of the 3,600 hospitals reporting on their emergency department’s performance to the Centers for Medicare and Medicaid Services (CMS). The seven measures CMS publicly reports relate primarily to the amount of time taken in the ER such as time for diagnosis, medication, and admission to the hospital, and are weighted according to the priorities of women surveyed. A hospital can be eliminated from the award if they fall outside the 25th percentile for two or more of the seven measures, depending on their importance. The award is also limited to those hospitals with a solid recommendation on Hospital Consumer Assessment of Healthcare Providers and Systems. "At Mercy, we are focused on providing the highest level of quality, safety and service to all of our patients and are proud to be recognized for our commitment and dedication," said Sean Williams, President and CEO of Mercy Medical Center. In 2013, Mercy Medical Center Emergency Services received more than 23,500 visits. In 2010, Mercy's Emergency Room revised processes to reduce the time that patients waited to see a physician and in 2011, Mercy implemented the first "Senior ER" in our region. Recognizing that seniors have unique needs, all Emergency staff members were trained on geriatric medicine and the specialized care needed for individuals 65 years and older who may have complex medical conditions, are taking multiple medications, or have unique physical, emotional and spiritual needs. The Senior ER featured a comprehensive assessment for physical function, cognitive status and level of risk and a complete medication review by pharmacy. The Emergency Room was remodeled to feature treatment rooms with softer lighting and more peaceful surroundings, non-skid/no-glare floors and extra thick pressure-reducing mattresses among other amenities. Mercy Medical Center – Clinton is a Catholic, not-for-profit, full-service community health system serving Clinton and Jackson counties in Iowa and Carroll and Whiteside counties in Illinois. It is the sole hospital provider to the greater Gateway area. Mercy – Clinton operates 346 licensed beds, including 183 long-term care beds and a 23-bed dementia care unit. Services include a radiation oncology center in affiliation with the University of Iowa Hospitals and Clinics, two cardiac catheterization labs, renal dialysis, and a trauma center. Residents also have access to the skill of Mercy’s home health and hospice care, as well as quality equipment and supplies through Mercy Home Medical Equipment. With two main campuses, Mercy – Clinton has a staff of nearly 1,000 employees, making it the community’s largest employer. The organization is a member of Mercy Health Network based in Des Moines, Iowa, and CHE Trinity Health based in Livonia, MI, one of the largest Catholic healthcare systems in the nation. For more information about Mercy Medical Center – Clinton, visit http://www.mercyclinton.com.